Jewels of the Universe - Jason interprets the rich beauty of the nighttime sky in his latest fabric collection, The Celestial Collection. Then he went on to create the quilt you see below. The project is a masterpiece of design and coloration as we know Jason to accomplish so well. 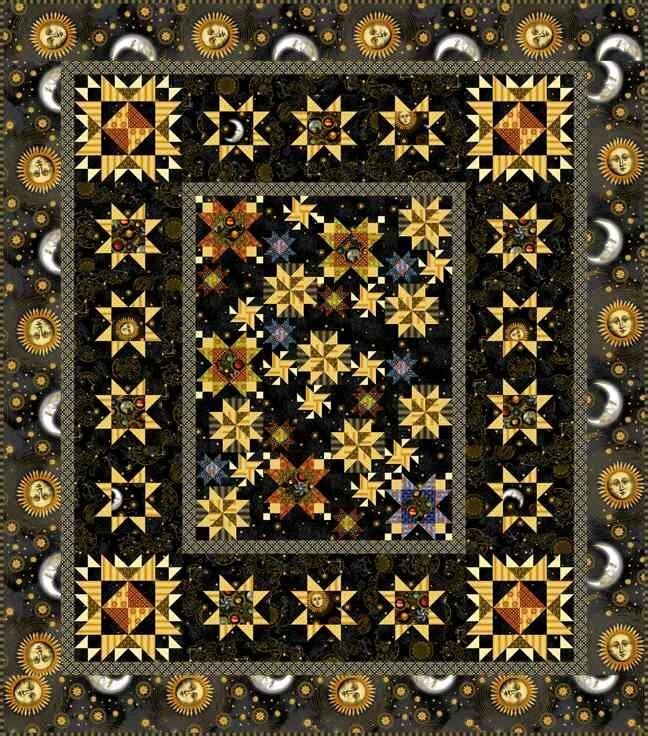 The accompanying book is your instruction for the Jewels of the Universe quilt as you see it below when you sign up for this new block of the month. We are offering the black version of this stunning quilt using all 13 pieces of the collection. The finished Queen Sized quilt measures 96 12/ x 109 1/2", and includes more than 19 yards of fabric, including binding. This is a 6 month program is scheduled to begin in Mid October, 2015. Cost of the program is $289. Book included. Sign ups begin mid September.